Dominic Di Paola was more than happy to see his side grind out a derby win over East Grinstead Town on Saturday and had no qualms in admitting they weren’t at their best. Goals from Joey Taylor, Will Hoare and a delightful chip from Chris Smith helped the Hornets to a 3-1 win as they got back in action in the Bostik League South East Division. The victory saw them up to 11th and in a healthy position in the table with games in hand after their recent cup exploits. Di Paola was keen to see his side take those positive cup displays into their domestic campaign and while admitting they made ‘hard work’ of it, he was content to win ugly. 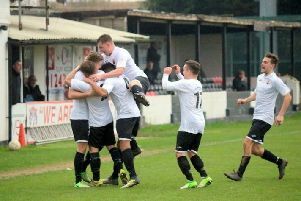 The hosts took the lead after just four minutes when Taylor’s cross was deflected into the net by Ryan Johnson, but the visitors hit back a minute later when Dean Gunner’s free kick found the net. Horsham retook the lead ten minutes later when Hoare’s clinical finish wrapped up a fantastic move from the hosts. After a period of pressure in the second half when East Grinstead searched for an equaliser, Horsham made the game safe seven minutes from time. Substitute Smith found himself one-one-one against visiting goalkeeper Sheikh Ceesay, before cleverly lofting the ball over his head and underneath the crossbar. Di Paola explained: “The result was pleasing, but I think we made hard work of it at times - we could not quite get going. “The scoreline looks comfortable, but it was a scrappy one, although it is pleasing to get the win when you are not playing at your best. “There have been games this season - against Bracknell and Poole for example - when we have played a lot better and got nothing from it. “In that respect, it is nice to win when you are not on it, it’s pleasing, although it was quite comfortable in the end as we hit a post and had another good chance. On individual displays, Di Paola added: “Will Hoare was excellent and Rob O’Toole had a brilliant game. Horsham: Pelling, Metcalf, Shelley, Hyde (Lovegrove 80), Merchant, Taylor, Hoare, Harris, Richardson-Brown (Smith 60), Brivio (Hayward 60), O’Toole. Unused sub: Baxter.